Our guest post this month features an article by Dr. Wendy LeBolt that discusses the process of a young athlete trying out for a team. As usual, Wendy brings excellent insight, warmth, and a lively writing style to this topic, explaining what athletes and their parents should expect during tryouts. Jodi had worked her way up the ranks to one of the area’s top teams, pretty much by coach’s invitation. Smooth sailing until her team and another decided to merge. There would be open tryouts for the Division I team. She showed up early on a Saturday morning, signed in and pinned a number to her t-shirt. Then she scanned the field with huge eyes that told me exactly what she was thinking: “What am I doing here? There are 45 girls who are all better than me.” That’s the day she became a competitive soccer player. That’s an experience that set her on track for success beyond the athletic field. Here’s what she learned. When you look at all those other kids, there may be something they do better than you do. They are probably looking at you and thinking the same thing! There’s a lot to being a good player. Some might be more aggressive. Some have better ball skills. Some shoot better. Some defend better. Some run faster. Some have a knack for being in the right place at the right time. You are probably not the best at all these things and neither are they. But the coach is looking for the best mix of these characteristics in the players he will choose. Coach probably has a player evaluation sheet. Here is the information we collect at a soccer club where I coach. The categories will be slightly different depending on your sport so ask yourself: What does the game demand of a good player? Where are you strong? Where are you weak? Then, go to work. Work on your strengths; they’re likely what will get you on the team. Work twice as hard on your weakness; they’re likely what would keep you from getting on the team. If you need speed, then run sprints. Short repeats of 10-12 secs, with gamelike speed and very short rest. If you need endurance, then use longer repeats of 20-60 secs at a slightly slower pace. If there are ball skills, work on these until you can do them without looking, left and right. Add the effort traits like: work-rate - your effort off the ball/hustle; coachability - listening and doing exactly as the coach asks; good decision-making and poise - use your head, play your game and keep your cool. A word about confidence. You may not feel confident, but don’t psych yourself out by looking around. Pay attention to your own game and stay focused on what you know you can do and do it well. If you make a mistake, recognize it and come back stronger. Everyone makes mistakes; coaches are looking for what you do next. Then, take the long view. Choose to have fun. Meet some other kids. Learn a few things. Act like the awesome game you’re playing today is no big deal - just the way you always play. By no means turn and look to see if the coaches were watching you when you just left that other kid in the dust. Be consistent. Play your best. Trust that over the course of the tryout, you will get the coaches’ attention. How Can I increase my Chances of Being Picked? It may sound funny but I always tell kids to “dress for success.” By that I mean wear something to tryouts that will make it easy for coaches to distinguish you from other players. Don’t blend in. Everybody wears a white t-shirt and black or white socks. Why not wear a tie dye shirt? Orange socks or pigtails - if it suits your style. How and when the coach will contact you after the tryout. How many sessions will there be. Can you come to more than one? If so, be sure to attend as many as you can to show your interest. 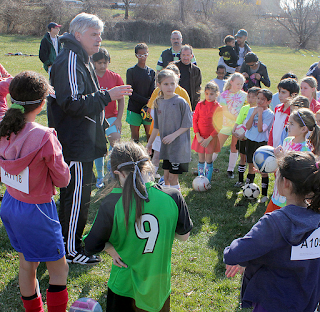 Sometimes a coach is looking to fill a particular playing spot or two. Or he may prefer one style of player over another. It’s fair game to ask about this. Be prepared for the “I’m sorry but we don’t have a spot for you” phone call. It’s the rare player who never gets the “turn down” call. Be ready. Ask what you can work on for next time. Then thank the coach, and start preparing for next time. Jodi did make that Division I team. They saw something in her they could work with even though she was far from the best player at those tryouts. You can’t control whether or not you’ll be chosen, but you can adopt the attitude that the tryout process will make you better. And that makes you way more likely to make the team - this time or the next time around. Dr. Wendy LeBolt is the CEO of Fit2Finish, LLC, providing dynamic fitness and injury prevention programs for youth athletes and their teams in the Mid-Atlantic area. Read her blog @Fit2Finish.com for free fitness information and tips you can put into play. Thanks for inviting me to post, Jeff. I hope your many readers will find something here that will make tryouts an "I am able" kind of experience. Wendy points out two things that stand out here. One is preparation. In other words you can't just 'show up', which alludes a little to the attitude you bring. Obviously, you need to be confident in yourself, but not just feel that throwing your cleats on the field gets you on the team. The other is working on your weaknesses AND your strengths. Both are important, not just simply working on the skill areas you might be lacking.